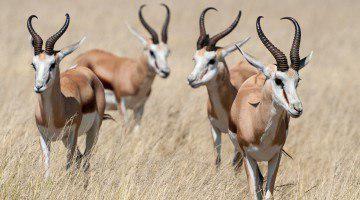 The Kalahari and Namib deserts offer an abundance of scenic, wildlife and cultural attractions. Explore the sights of Cape Town; view the mighty Augrabies Falls and Fish River Canyon; see the wild animals of the Kgalagaladi and Etosha National Parks; summit the highest sand dunes in the world in the Namib Desert. Meet ancient Bushman and Himba tribes people and relax along the Okavango and Chobe Rivers ending at the world-famous Victoria Falls – experience this exciting route Overlanding in style! The tour starts on day 1 with a pre departure meeting at 18h00 in the lobby of the hotel. Set against the majestic Table Mountain, Cape Town offers scenic, historic and cultural attractions. Day 2 depart from Breakwater Lodge at 08h00, for a full day peninsula tour. Driving along the Atlantic seaboard via Hout Bay and Chapman’s Peak, we visit the Table Mountain National Park – Cape Point, returning along the Indian Ocean coastline back to our well-situated Waterfront hotel. A morning or afternoon cable car ascent up Table Mountain is included (weather dependent). Dinner can be enjoyed at the bustling Waterfront at clients’ own expense. Departing Cape Town we pass through the picturesque Namaqualand region arriving in the historic town of Calvinia, nestled on the foot of the Hantam Mountain range. During the months of August – October the landscape is transformed into an explosion of colour due to the numerous wild flowers of the region. Leaving the Little Karoo we head north to the Augrabies Falls National Park. Here the mighty Orange River plummets 56m into the gorge below. The local name for these majestic falls is ‘Aukoerebis’ or ‘place of great noise’. We spend the afternoon enjoying the falls from its many viewpoints. We head north into the Kalahari and the magnificent Kgalagadi Transfrontier Park. Covering over 3.6 million hectares this is one of the largest reserves in Africa. Due to sparse vegetation in the area excellent predator sightings are common including that of the famous black mane Lion. We enjoy a game drive to our lodge and when departing the Park. At our lodge clients can interact with the ancient Bushman people, discover the true wonders of the Kalahari on optional activities (own expense) including Night Game drive, Sunset Pan drive, Kalahari Nature walk. The evenings are spent gazing in wonder at the stars through the telescope on the lodge viewing deck. Leaving the Kalahari region we head west and enter Namibia arriving at our lodge situated in a scenically beautiful area. The following morning is free to relax and in the afternoon we visit the Fish River Canyon, which is one of the largest and most awe inspiring canyons in the world. Our journey takes us north through ever changing scenery to our accommodation located on the edge of the Namib Desert. 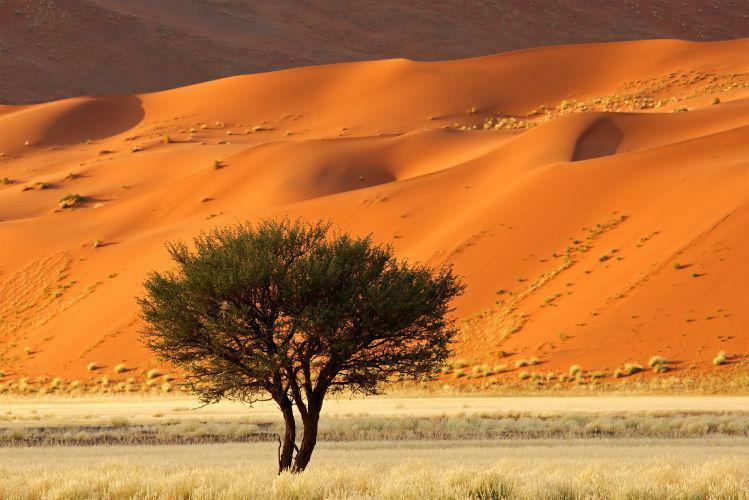 The following morning is an early departure for Sossusvlei, stopping in the dune belt to witness the changing colours of the world’s highest sand dunes. 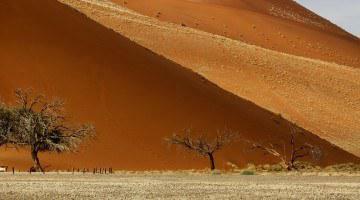 We undertake a 5km walk to Sossusvlei and Deadvlei. In the afternoon we enjoy a short hike through the Sesriem Canyon. We drive inland through the Damaraland region with its vast and rugged terrain. Its mountain ranges are intercepted by wide gravel plains, which run into sandy, vegetated riverbeds and hot, dry valleys. Our lodge is located on top of a mountain with spectacular views of the surrounding area. Spend the afternoon taking in the incredible setting or simply relaxing by the pool. In the morning we visit the Himba tribe, a semi-nomadic tribe, living in scattered settlements throughout the region. They are characterised by their proud yet friendly stature and the women are noted for their unusual beauty, enhanced by intricate hairstyles and traditional dress. A few hours are spent learning more about these fascinating people. After our visit we proceed to Etosha National Park where we enjoy our first game drive and relax by the floodlight waterhole in the evening. This Park is one of the most important reserves and game sanctuaries in Africa with thousands of wild animals such as blue wildebeest, springbok, zebra, kudu, giraffe, cheetah, leopard, lion and elephant making this area their home. The day is spent on game drive through the Park from the Western to the Eastern side of the Park. We continue to the Eastern side of the Caprivi Strip and arrive at our lodge overlooking the flood plains of the Kwando River. A lush area teeming with wildlife and birdlife offers a great opportunity for a late afternoon game drive (own account). We travel across the Zimbabwean border to Victoria Falls – without doubt one of the greatest and most spectacular sights in Africa. Days are spent at leisure to browse the local markets, to experience the many optional activities on offer in the adrenalin capital of Africa including white water rafting, bungi jumping, microlighting/ airplane or helicopter flights over the Falls, rhino walks, elephant back safaris, and to visit the Falls (own expense). Overnight on the banks of the Zambezi river at A’Zambezi River Lodge (or similar accommodation). LOCAL PARK FEE & ACTIVITY PAYMENT: ZAR 2500 payable in cash to guide on day of arrival. 21 nights lodge, chalet and small hotel all with en-suite facilities. Breakfast included throughout. 13 dinners included. All lunches own expense. Flights, transfers, airport taxes, visa costs, all lunches & dinners where not specified, optional excursions, drinks, mineral water, gratuities and personal expenses. Once a 19th Century prison, the Protea Hotel Breakwater Lodge today provides comfortable and affordable accommodation in a spectacular setting that looks over the bay and up onto Table Mountain. Neighbouring Cape Town’s CBD, the Hotel is within easy reach of the beaches, mountain walks, city hotspots and the airport. Including all modern amenities, accommodation options include Standard and Deluxe Rooms, as well as Business Suites and Family Units. Aside from our two exclusive restaurants and a bar, we offer state-of-the-art conference facilities and an extensive choice of banqueting venues. Hotel facilities also include a Prokidz lounge for children’s entertainment, mini in-house gym, Wi-Fi (charged at an hourly rate) and our friendly Reception staff are available to assist you 24hrs a day. In South Africa’s largest province, the Northern Cape, about halfway between Cape Town and Upington in the Karoo, lies a gem that can Alta & Erwin Coetzee truly be called Home away from home. In this haven you can relax to your heart’s content because the atmosphere is so conducive to it. This haven, called Calvinia, is a town where people are still real, where you can stop a stranger to ask directions, or sometimes just to chat. Here you can allow yourself to be “transported” to the past while still having the best of modern society at your fingertips. In Calvinia you can relax and recharge the batteries without the bustle of over- populated holiday resorts. Calvinia is a town in a time warp, where the past and present are intertwined. This is a land where, 250 million years ago, prehistoric dinosaurs tread the earth, leaving unique flora, fauna, geology and paleontology in harmonious concord with the infinite universe … truly a place with room for all. Life in this picturesque town seems to be going slower than elsewhere, giving you time for the more worthwhile things in life. Here you are welcomed like the prodigal son, and treated like a local from the outset. The friends you quickly make in this town will go out of their way to accommodate you with almost any request you may have. Here you easily forget about traffic jams, and other perils of modern life. The lasting first impression is one of calm sophistication. Vergelegen Guest House was built especially with keeping the guests needs in mind. Situated on the outskirts of Kakamas on a beautiful farm setting near the world famous Augrabies Falls. One overlooks the contrast of barren landscapes and lush green vine yards of the Orange river valley. The guest house offers 16 luxury and comfortable en-suite rooms each with a personal touch. Self Catering and Family Units / Suites available. All rooms have their own private entrances which walk out on a patio. Take time to relax at the swimming pool under the African sun or take a walk down to the river. In winter you can relax at our cozy fireplace. All rooms have air-conditioning and heating. Provided in the rooms are television with M-Net, some with bar fridges, coffee and tea facilities. All linen and towels and complimentary amenity kit are provided. Additional services include: laundry services, private braai area and e-mail and fax facilities. Wake up calls and room service available. 24 hour reception. On the premises you can dine in our intimate a le carte restaurant which had numerous write-ups. Dine at the fireplace or outside on the patio. Do enjoy sundowners and a hearty meal. A feast of well prepared cuisine to excite everybody’s taste buds. We also cater for vegetarians. Cocktail lounge and Coffee Shoppe available on the premises. Fully licensed.
! Xaus Lodge provides luxuryaccommodation in the Kgalagadi TFP for eco-tourists and visitors to the Kalahari. The complex comprises a central lodge building and 12 individual chalets, each with its own deck overlooking a vast saltpan and waterhole fed with fresh water. The central lodge building comprises a welcoming reception area with its unique wall-hanging made by the ladies of Vezokhule, a sewing co-operative in Upington. The cosy lounge has a fireplace and a library of selected books for paging through before dinner. Our dining area overlooks the pan, with furniture hand-made in Upington and images burnt by Bushmen artists. At the art and craft shop, you can purchase locally made Bushman crafts as well as crafts made in the wider Kalahari. Visit the large observation deck from which we gaze in wonder at the night sky, and by day the swimming pool provides cool relief from the desert heat. Wood is a precious commodity in the Kalahari, so the inviting fire in the boma is made in the traditional method with three or four crossed sticks around which everyone huddles companionably. In the en-suite chalets we provide purified drinking water from the desert which you will find in a flask in your bathroom. Winter sheets and gas heaters provide comfort for the cold nights, and ceiling fans bring relief in the hot months. Twin Beds (can be set up as King size standard length on request). Each chalet with its own deck overlooking the waterhole in the pan. Large shower, wash-hand basin and separate flush toilet. Twin Beds Each chalet with its own deck overlooking the waterhole in the pan. Large shower, wash-hand basin and separate flush toilet. Twin & King Beds Each chalet with its own deck overlooking the waterhole in the pan. Large shower, wash-hand basin and separate flush toilet. Canyon Village lies at the foot of a sweeping rock face in Gondwana Canyon Park. Well-appointed cottages in the Cape Dutch style afford views of the vast canyon scenery. The thatched main building is built right into the massive granite boulders and houses a restaurant and cosy bar. With the famous Fish River Canyon just 20 km away the village is a perfect starting point for exploring the canyon. Dozens of murals depict the history and culture of the Bondelswart Nama, the earlier inhabitants of this area. Relish the peace and quiet and enjoy the views at the ‘pool with a view’. The Cape-Dutch cottages line the escarpment, sometimes referred to as a scene from a western film. Rooms are spacious and have twin beds and an en suite bathroom (showers only). All rooms have air-conditioners and complimentary tea and coffee. The Cape-Dutch cottages line the escarpment, sometimes referred to as a scene from a western film. Rooms have twin beds and en suite bathroom (showers only). All rooms have air-conditioners and complimentary tea/coffee.This is a wheelchair friendly room. The Cape-Dutch cottages line the escarpment, sometimes referred to as a scene from a western film. Rooms are open plan, spacious and have three beds and an en suite bathroom (showers only). All rooms have air-conditioners and complimentary tea/coffee. The 20 affordable, self-catering accommodation units under canvas are equipped with an en-suite bathroom, shaded veranda with a fitted kitchenette, barbeque, power points and an adjacent parking area. Each twin-bedded bedroom features a fold-out sleeper couch where 2 small children (under 12) can be accommodated for free when sharing with their parents. Meals can be enjoyed at the nearby Sossusvlei Lodge restaurant. Exciting desert activities like Guided Excursions to Sossusvlei, Quad Biking, Sundowner Drives and magnificent Scenic Flights over the dunes and coast can be booked at the Sossusvlei Lodge Adventure Centre. Among the town’s captivating contrasts and old traditions, Gondwana’s Delight is a fresh breeze in the desert. Conveniently located within short walking distance of the ‘Mole’, this modern, uplifting and inviting hotel is the ideal base for your stay. Every effort is made to surprise and delight guests with thoughtful touches and locally inspired reasons to smile. From the easy comfort of the hotel, the warm and welcoming service Gondwana is known for, to the assistance provided by knowledgeable Delight hosts for anything from activity bookings to dinner reservations – your stay is always an effortless and memorable experience. The Delight boasts 54 rooms, of which 10 of these are loft family rooms. There is a breakfast dining room, a cozy bar, a garden and secure parking. The hotel is centrally located and easy walking distance from central town. The familly rooms are loft rooms, with twin beds downstairs and twin beds upstairs. All rooms are equipped with an airconditioner, tea and coffee facitlties, fridge, hairdryer and a safe. Rooms are ensuite. These rooms have twin beds. All rooms are equipped with an airconditioner, tea and coffee facitlties, fridge, hairdryer and a safe. Rooms are ensuite. These rooms are situated on lower level of the hotel, facing the inside courtyard. They each have twin beds. All rooms are equipped with an airconditioner, tea and coffee facitlties, fridge, hairdryer and a safe. Rooms are ensuite. These rooms are situated on lower level of the hotel, facing the street side of the hotel. They each have twin beds. All rooms are equipped with an airconditioner, tea and coffee facitlties, fridge, hairdryer and a safe. Rooms are ensuite. This rooms are situated on lower level of the hotel. The room has twin beds. All rooms are equipped with an airconditioner, tea and coffee facitlties, fridge, hairdryer and a safe. The ensuite bathroom has both a shower and a bath. Follow the rhythms of the seasons, and whether your interests are bird watching, or just plain getting away from it all, you too will find that you are woven into this same rhythm. Welcome to Ugab Terrace Lodge, situated in the heart of the best tourism country approximately 430 km from Windhoek. We provide an ideal setting for relaxation in the bush. We offer perfect tranquillity, superb accommodation and exquisite cuisine to make your stay with us a memorable experience. Namibia is a world on its own! Indulge yourself with the breathtaking view at Ugab Terrace Lodge, animal life and overwhelming experiences of bathing in a swimming pool constructed in the rocks at the top of the mountain. Treat yourself with a walk in nature to experience our lustrous vegetation at Ugab Terrace Lodge. Whilst enjoying the impressive sunrise and sunsets from the balcony of your Bungalow, you allow yourself to once again come into contact with endless tranquility and peace of mind. Once you have experience our wild life in their natural habitat, you will understand why we believe that when you visit our lodge, you must be very close to heaven. Namibia is the country to begin your African journey. The daily life is very European, but when in nature, you realize that you are away from the fast lane of life. The food and drinks, as well as the experience to sit next to an open fire and smell that Steak, or Oryx, sizzling on the coals, are palatable to European standards. Picturesquely situated on the south bank of the Okavango River, 16 km west of Rundu, Hakusembe River Lodge makes for the perfect stopover on the way into Caprivi and to the Victoria Falls. The 10 chalets (with air-conditioning) offer magnificent views of the river and the lush vegetation which teems with diverse birdlife. The swimming pool invites to cool off on hot summer days. Experience the river world on a boat trip and relish the enchanting atmosphere during dinner in the restaurant and with a drink at the bar. A campsite is available. As the evening sky turns into a red glow you sit back, high above the river, enjoying a chilled drink while listening to the deep grunt of hippos – this experience awaits you on the sundowner deck of Namushasha River Lodge on the Kwando River in eastern Caprivi. Situated 24 km south of Kongola on the C 49 (former D 3501), it is the perfect stop-over en route to the Victoria Falls. Apart from 24 rooms in chalets the lodge consists of a restaurant, a bar and a swimming pool. Watch elephant, hippo, buffalo or sable antelope on our excursions by boat and off-road vehicle or take time to observe the colourful birdlife (more than 400 species). The rooms are closely situated to the river bank, most rooms have a view on to the river. Each room has twin beds, mosquito nets and en-suite bathroom (shower). Each room has it’s own porch.For family rooms, request our interleading rooms. The family room is a open plan room and has 4 single beds and a en-suite bathroom. The immense beauty of the Zambezi has captured the hearts of explorers for over a century. 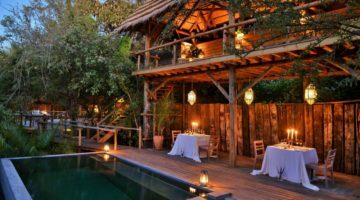 A’Zambezi is famed for its African-style design, curvy lay-out, distinctive thatched roof and its perfect blending into the surrounding environment. Likewise, its accommodation follows the same theme, with thoughtfully decorated river-theme rooms in a variety of options.